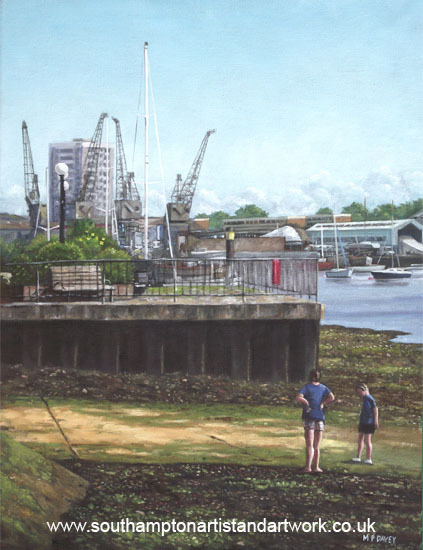 This painting is a view of one of the slipways at the docks at Southampton, along the River Itchen. It is named as the Tredegar Wharf, and is very close to Ocean Village and the Itchen bridge. The artist was drawn to the interesting industrial landscape, a combination of flats, cranes, warehouses and water. The bright green algae on the slipway was colourful, and the two children standing on the slipway add interest and scale. The tower block in the back ground is a local landmark and can be seen in other paintings. It is painted on a canvas in oils at a size of 18"x14", during 2011.